We love our tent. Spacious. Green. This summer we experienced a lot of rain and heavy winds while camping. It kept us dry and warm inside. No water leaks and holded well the strong winds too. Excellent choice. We haven't used it yet at electric pitch, but this is something we are planning. It has electric cable access which is handy when camping with electricity. It allows to bring little fridge along to keep mild and butter fresh. We also love that this tent has inside pockets in the sleeping area from both sides. Moreover, there is a repair kit which was included if anything would happen while camping. We always wait for our campings with excitement as the tent gives the great feeling of staying like at minimised home. After buying the tent in 2016, we were unable to use it as a family member was diagnosed with cancer. This year we finally got away for a two night break and used the tent for the first time. We were pleasantly surprised to see how easy it was to erect but by the second morning we were disgusted with it. There is a MAJOR FAULT with this tent: Having had one night of rain (we stayed dry), during the second night the wind changed direction and began to blow straight at the front of our tent. The front door zips down both sides but not along the bottom. Instead there are two silly little toggles that fit into loops and are supposed to keep the door closed to the groundsheet. THEY ARE USELESS. We woke up in the morning to find a lake inside the tent where the rain had landed on the door, run down and straight inside. This STUPID piece of design is totally unacceptable and I am writing a strongly worded complaint to Hi Gear. Perfect size tent for me and husband, full standing height and large bedroom area. Can fit 3 single airbeds, wouldn't squeeze any more in. It's surprisingly spacious when you step inside. I bought the footprint, makes pitching easier and protects/insultes ground sheet. Did not get the carpet, picnic rugs do the job. So easy and quick to put up and take down. This is our first tent which we purchased after I obsessively did research and looked round at all the tents in Gooutdoors. 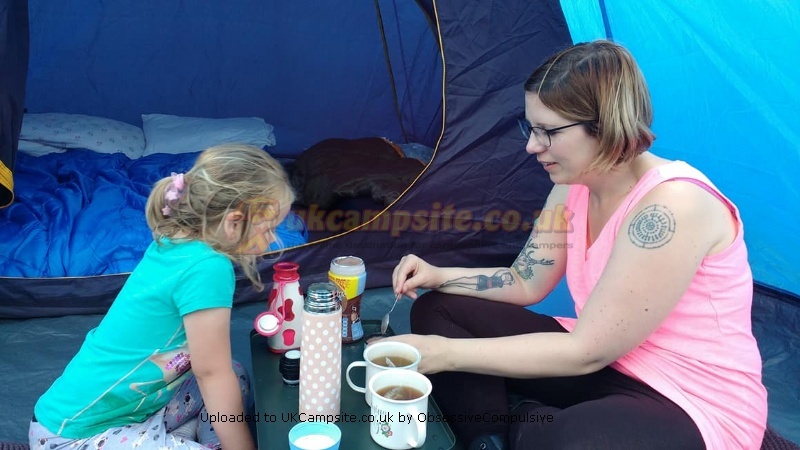 We chose it because it was the best tent we could afford for our budget and because of the darkened bedroom which is a new feature for the 2017 version. Ours is a blue one. The darkened bedroom was an important feature as my husband is very sensitive to light which wakes him up. We found that although the room was darker than a lot of tents it didn't block out all of the light in the morning so wasn't like having black out curtains, but im sure it's a lot better than the average tent in terms of light in the morning. The 5 berth bedroom is the perfect size for me and my husband and our 4 year old. We fitted in a king size blow up mattress and a single mattress with some space left over. I would say the maximum number of people you could get away with is 4 unless they were all lying like sardines on camping matts. The living area is a good size and the windows and vents let in light and air. I love the feeling of being inside the tent even without a blanket on the floor. We tried to save money by only buying the tent (shop returned from a site on Ebay) but then we had to pay �30 in Gooutdoors for the footprint sheet. The footprint sheet definitely makes the tent more comfortable as not only does it proteck the bottom of the tent, it also makes it more insulated and comfortable to sit on the floor. We did a practice run in our local park and found the tent very easy to put up. It only has three poles which fold up in a carry bag it comes with. We didn't have to attach the inner bedroom as the person in the shop had already done it so we don't know how hard that is but I don't think it would be. 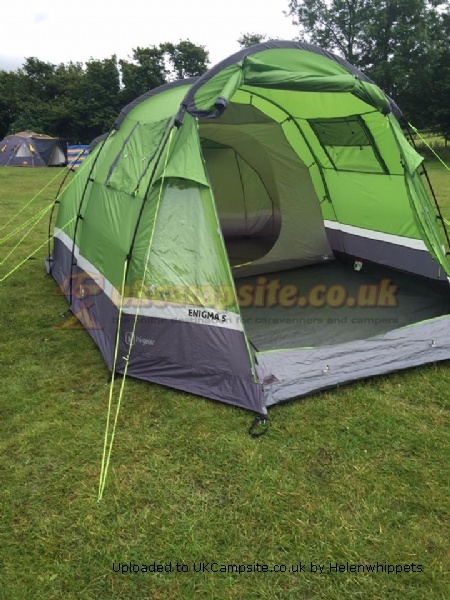 Overall this tent is perfect for a family of three and I am sure we will have many lovely camping trips in it. I am hoping to buy the canopy for it before next year. I love this Tent, it was an ebay special so had already been used. Its the first tent I have chosen and bought, normally I have stayed in little tiny ones but for my whippets and I its great, very easy to put up and take down, plenty of room for lots of things. I have used it 4 or five times now and have no complaints whats so ever with it. Recent camping trip (my first in over 30 years) and we bought the Hi Gear Enigma 5 as a bundle so it came with a footprint, carpet and porch. It was simple to put up and very quick. The inner is wrapped. In the outer - I'd recommend splitting them when you pack so your inner doesn't get wet if it's raining when you pitch up. There is only the 1 bedroom - personally I can't see how you'd get 5 sleeping in there comfortably - unless 3 of you were children. 4 adults perhaps. Certainly more than enough space for 2 though! The living space was roomy with more than enough space for a large table and deckchairs as well as our cool box and picnic basket and other bits and bobs. The porch meant we extended the living space by double and meant we.Could keep our cooker and gas bottle dry but outside if the actual tent. Great if it's raining too so you can remove wet things without messing up the interior. The tent and accoutrements are easy and quick to dismantle and stow in their respective carry bags. I'm impressed that the tent is not too heavy to carry either. 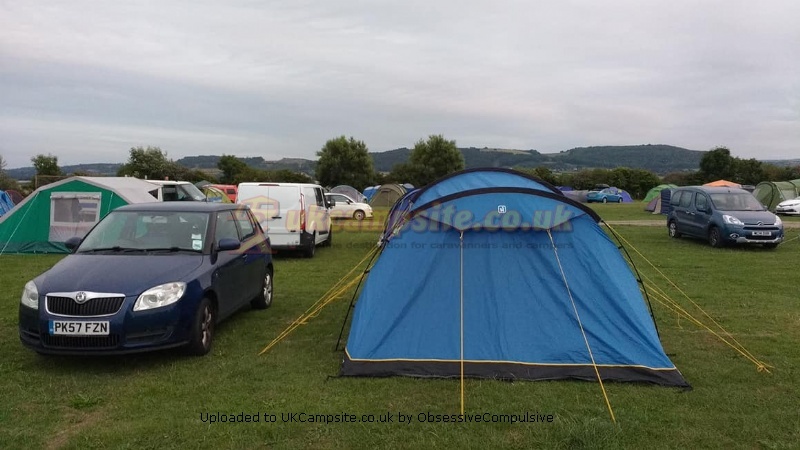 This tent is really good value for money - it's didn't see so large in the showroom - we were amazed at him much space we actually had once we had it pitched. Can't wait for my next trip! The carpet was a total boon and also came with a door mat. I am really pleased with this tent. Pitched it with ease . The canopy is great too and best of all it fits nice and snug just behind the drivers seat. Its only me, my wife and daughter and can comfortably get two double air beds in but its a bit tight for a single as well. Can't wait to use it again in three weeks time ! Looks very smart and neat. Is ideal for me and my partner. Very spacious especially with the canopy on to add even more space. Definitely recommend you use a canopy with it as otherwise when it rains and you open the tent you tend to get just inside of the tent wet. Plenty of pockets in the sleeping area. Very easy to erect my partner and I can get it erected and set up in about 15 minutes now. Would definitely recommend it for small families or just couples. Bought the package, including canopy. Really pleased with it. Just spent this weekend in torrential rain, not a smudge of rain inside. Probably just a little condensation, but only enough to see some slight discoloration. With the canopy its superb, but without it, I can imagine the sloping front would be a draw back. Easy to put up, in the dark, with the winds blowing a force 5 at 90 degrees! Add your review of the Enigma 5! The Hi Gear Enigma 5 is a simple tunnel tent with a spacious bedroom, large living area and plenty of windows to give it a roomy feel and let light in. Plenty of pre-attached luminous guylines help you to keep the tent stable in windy conditions, and remain visible in low light (especially on a crowded campsite). There are a few additions to the Enigma 5 available, to make your camping experience even more comfortable. The Enigma 5 Carpet will make it feel more homely, the Enigma 5 Footprint will insulate and protect the floor (and make pitching the tent even easier), and you can extend your sheltered space with the Enigma 5 Canopy .